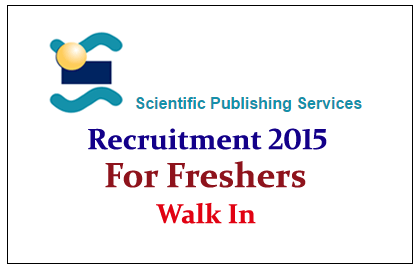 Scientific Publishing Service hiring Freshers for the year of 2015, location at Chennai. Eligible candidate can apply here, for more details check below. SPS Started in 1995 with one office and 54 employees SPS today operates from eight offices with around 3500 staff. Sharad Wasani is a pioneer in the publishing outsourcing business and introduced this concept more than 30 years back. SPS is a full-service KPO partner offering services that cater to a broad spectrum of areas in publishing, finance, accounting, marketing, and design requirements of its clients. B.E/B.Tech Graduate with Biotech, Bioinformatics, CSE, ECE, EEE). M.Sc, M.E,M.Tech (2013 /14 Passed out). Candidate with English as a medium of studies are more preferred. Willing to work in shifts (6.00 am-1.30 pm and 1.30 pm-8.45 pm). Interested and Eligible candidates can directly Walk-In to below mentioned venue.